What’s happening on Rosa Parks Way? As you’ve walked, biked and drove through the neighborhood this summer you’ve probably noticed a lot of construction activity on Rosa Parks Way. The Portland Bureau of Transportation (PBOT) is working on a project to extend a 6-foot wide bike lanes that currently ends at the intersection with N. Vancouver and starts again on the west side of I-5. This project will also add a center turn lane to this section of Rosa Parks Way and islands for safer crossings of Rosa Parks Way at various locations. The PBOT plans to have this project complete by the end of August and is currently waiting for new signal equipment to be delivered. 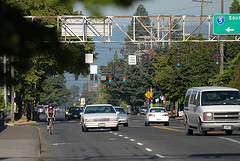 You can find more information about the current status of the project at the BikePortland blog. Bike Portland also has more details about the project and some background on the project. This entry was posted in Issues, Public Safety, Transportation by Noah Brimhall. Bookmark the permalink.